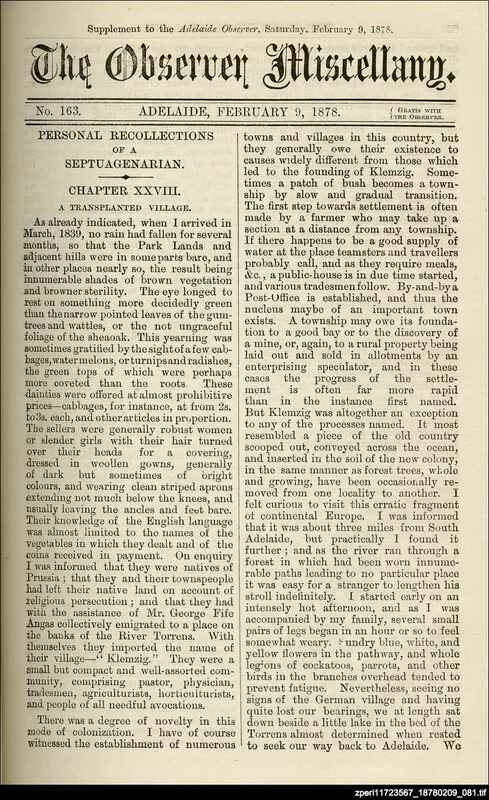 The Observer miscellany was a free literary supplement published with the Adelaide observer from 1875. The small 16 page magazine lasted for five years. Its content consisted of stories, articles, poems, puzzles, riddles and a chess section. Although the amount of material contributed by local writers varied, this was often as much as half of the content, while the rest consisted of poems and serials copied from English and American magazines. (All the items in the 'Riddler' section were contributed by local readers.) Some well-known South Australians of the time, including Catherine Helen Spence, Catherine Martin, George Wilkinson and Nathaniel Hailes, were contributors to the Miscellany. 'The riddler' This was an important section of the Miscellany, containing three to four pages of chess notes, mathematical puzzles, riddles and complex word puzzles. It was stipulated that all contributions must be original. Mostly the contributors are identified only by initials. 'C.H.S.' has been identified as Catherine Helen Spence, who from mid 1879 contributed elaborate word puzzles. (5 July 1879, p. 430) The amateur poet, T.B. of Port Lincoln, was a regular contributor to this section. Eliza Strawbridge ('E.S.') was another contributor to the column. Closure The Miscellany ceased at the end of 1879 as part of the complete re-vamping of its parent Adelaide observer, from January 1880. The new look Saturday newspaper included an extensive literary section, with many of the Miscellany regulars, including Atha, Maurice, G.B.W. (George Wilkinson) and Robert Bruce continuing as contributors. Miller, E. Morris. Australian literature from its beginnings to 1935: a descriptive and bibliographical survey of books by Australian authors in poetry, drama, fiction, criticism and anthology with subsidiary entries to 1938, facsim. ed., Sydney: Sydney University, 1973.